Well the chance of another Caddis filled day was just too much for us and we headed down to fish Rim Shoals even though the generation report was none too promising. Everyone’s opinion of “safe” wading varies although personally I prefer to avoid water that is deeper than my waist while I am actually fishing particularly when you add flow to the equation. Moving across the stream I may tackle slightly deeper water although not much particularly when the water is fast flowing. 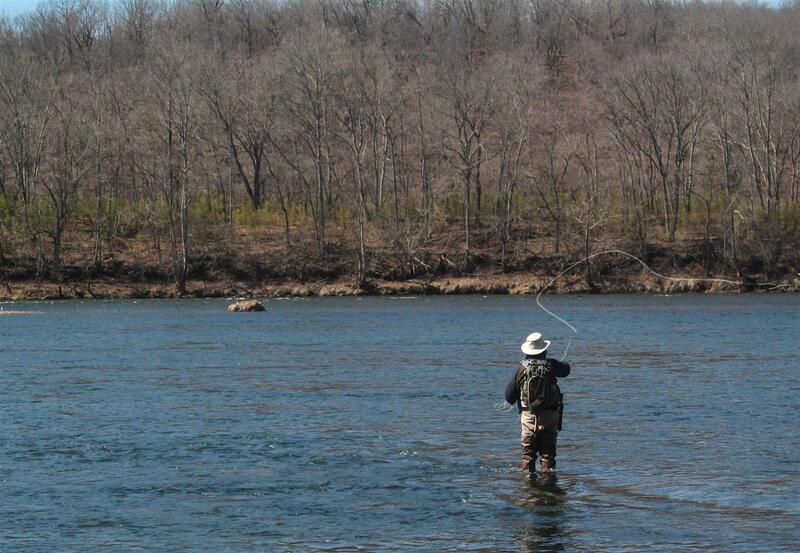 If you wade any tailwater fishery then you need to pay attention to water level so you can practice safe wading. In the case of the White River there are a number of sources for information on water conditions that will give actual generation (number of units and level) in both voice and online format. There is also an “estimated” generation scheduling available online that will give you the generation forecast for the next twenty-four hours. With no water release, Bullshoals tailwater is approximately 449-450 (tailwater height at the dam) and I generally consider a tailwater height of approximately 453 (3 foot increase in depth) as the maximum level for good wading. Of course this level is the level at the dam so you need to calculate how long that water will take to get to where you’re fishing. For example it takes roughly 6 hours for the water to reach Rim Shoals from the dam. So if the tailwater level at 6am changes from 450 to 453 then you can expect that level change to arrive at Rim Shoals by noon. Of course there are all sorts’ variables like how many generators and the cfs (cubic feet per second) rate. As generation reduces and the water level drops it takes far longer for the water at Rim Shoals to drop, so expect something in the region of 10 hours for the level to match that at the dam. Well all that said, overnight it had been 452 and there had been an hour of 454 between 6 – 7am followed by a drop back to 452 so we expected so increase around noon to 1pm and probably would see a drop in level while we were there. At the time we arrived the water was slightly above what I consider acceptable for some of the riffles to be fished, although there are spots where you can move out to cast. This didn’t stop us moving down and fishing each of the riffles where we caught fish on soft hackles including a 17 inch brown. There were hardly any Caddis coming off and although the water temperature was in the bracket (46), the sun was hiding behind a bank of cloud during the morning. The water did rise about 1pm and we decided to head further downstream to a nice run that is fishable even when the level is at my acceptable maximum. By the mid afternoon the clouds had gone and the sun had brought the air temperature to a pleasant 60 degrees which seemed to encourage a few of the hardier Caddis to make an appearance. Fish began to rise, albeit rather less than we would have liked, and I did notice a few bigger fish showing their heads. The rises were positive and on obviously to the white Caddis that were flutering downstream. It was time to tie on a new version of the olive bodied Caddis that I had tied using “furry” foam in #16. In the space of about an hour I had landed about a dozen fish including a nice plump 15 inch brown so the day had not been wasted. About the only downside to the day was the wind (it hadn’t been windy when we started!) putting my little 4 weight Superfine through its paces, although it did a sterling job for the majority of the time. The level stayed up at this for the remainder of the afternoon so we worked our way up the bank taking the occasional fish in the slack water eddies. A couple of highlights of our day on the water included being serenaded by a breeding pair of Bald Eagles and being over flown by a huge flock of Turkeys. It had been worth the drive south although the predicted generation for the next day was such that we decided to head home rather than stay overnight and fish the next day. Maybe the generation gods will be kind to us and give us some more wadable water later in the week.